It’s funny the lessons you keep telling yourself you’ve learned only to totally ignore them a few days later. For example: Don’t go more than 4 hours on travel days. Or: Don’t show up to a boondocking spot when it’s dark. Ever. We had already nearly gotten stuck in someone’s driveway when we got to Whitewater Draw after dark. Thankfully they didn’t shoot us and had an area we could get turned around in. Like Ashley said in the last post, we decided to break our 4 hour rule and try to make it all the way to Lake Mead which was 6 hours away. Due to some unplanned grocery stops the sun was going down when we got to the boondocking spot that night. Sigh, how did we do this again. I had said several times I was really worried about getting stuck in the mud - mostly because it was scheduled to rain the next couple of days. What we didn’t know was that it must have absolutely dumped a few days before we got there. So picture this - us with our 23,000lbs of RV headed down a primitive road to an area surrounding a lake bed at dusk. Unaware that there were areas of complete mud/sand mush waiting for us. Needless to say, I saw a nice spot when the ground was still solid, but let her talk me into continuing up to the ridge. We turned the corner, headed up the road and started sliding everywhere. This wasn’t good. But we couldn’t really turn around. So we tried to make it up the hill and got completely stuck. It was dark. And raining. We were on the side of a hill at an awful angle. We only had a 2 wheel drive truck, and a 13,000lb 5th wheel was on the axels. We tried a bunch of stuff and actually managed to end up in a spot where the trailer was mostly level. So we unhitched it and decided to wait the night out, hoping nothing would sink further. Of course, there were flash flooding warnings all night. We woke up around 4am to a horrible storm, shaking the RV like crazy. We were both picturing flood waters washing us down the hill into the lake overnight. Ugh. We woke up the next morning to survey the damage. Our back wheels were like 6 inches down in the mud. Thankfully it was sunny and warm, but there was another thunderstorm expected that afternoon. We tried our towing package people, but because we were so far off a main road they weren’t going to cover it. And honestly I’m not sure that they could even get back where we were. Cue internet friends to the rescue! Ashley had posted our plight on Instagram, and Mike and JorDanée Key from boldandadvenurous.com happened to be a couple of hours up the interstate. We had wanted to meet them for a while, and they had a shiny new 4WD truck and winch they needed to break in. Seriously, they drove 2 hours to come pull us out of the mud. They’re the best. It was definitely still muddy so we had to get creative. They deflated their tires a bit, got around in front of us and used their winch to pull the truck out of the massive ruts we had made. That was the easy part. Now we had to figure out how to get the RV away from that whole area. They had an airstream so no 5th wheel hitch. That meant we would have to hook back up and maneuver it out somehow. 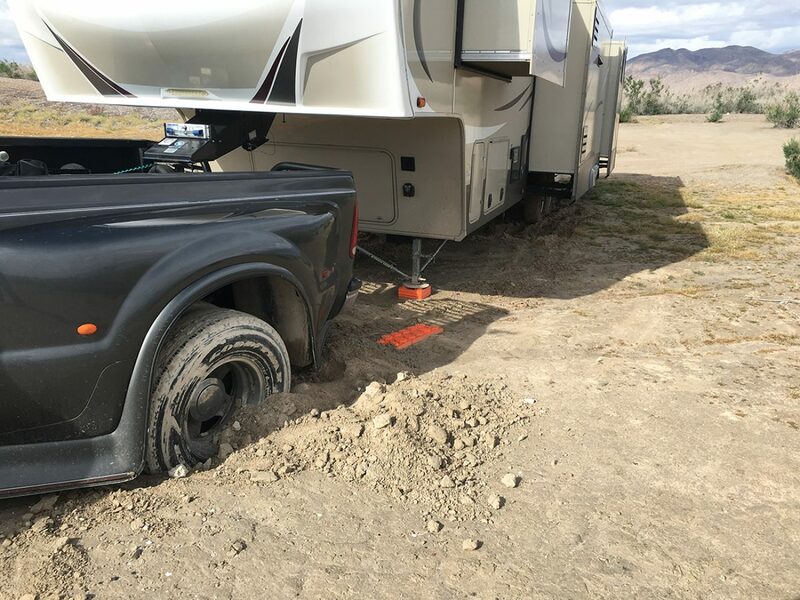 We backed the truck up at a 90 degree angle to the RV to avoid the huge holes we had made and hitched it sideways. First time we ever tried that! The they hitched their winch up to our truck, and between the winch and both our engines we were able to get us up onto more solid ground. But we weren’t done! The ridge we were trying to get up to was basically one way, and there wasn’t room to turn around. So we were going to have to back back down the hill and get it turned around before heading back around the mud to solid ground. The ground was really uneven, it was slippery and I was maneuvering a huge RV backwards down a muddy hill, but somehow we managed to get sort of where we needed to. There may have been some bush and tree casualties. But we got turned around and back to the solid ground! Oh my goodness what a huge relief. I thought we were going to be stuck there for a week till things dried out. We talked @boldadventure into letting us buy them lunch and we headed back into town for a great time of getting caught up and getting to know each other before they had to head out. They invited us to meet up with some other friends boondocking in Utah, and we ended up changing our travel plans to go see everyone. More on that later! Anyway, so after the incident we did end up staying at Lake Mead for several days - and it was glorious. Perfect weather, incredible views and only a 15 minute drive to Valley of Fire State Park. Which is what we’ll tell you about in the next post. In the meantime, here's some pics of the lake when we weren't stuck!